Many villagers, like these rolling tobacco in to beedis (South-Asian cigarette), have no choice but to work for the owner of the land where they live. Kolkata, India: I have spent the last two weeks transecting north India, from Rajasthan to West Bengal, gathering data relating to numerous forms of labour exploitation in numerous industries, from beedis to rice, to carpets and bricks. 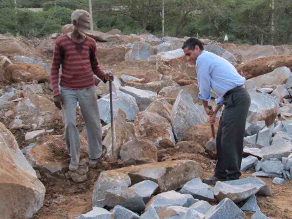 One of the forms of bonded labour I researched for the first time during this trip was stone crushing in Haryana. Try to imagine lifting an 18 kg metal hammer over your head, then flailing it down with all your strength into hard stone. Now try to imagine doing this in 40 C heat, with minimal food and water, twelve to fourteen hours a day, for a wage of $0.02 per square foot of stone you manage to crush. Finally, imagine you may receive half this wage now and then, or half of it may be deducted for debt repayment. I tried this work for ten minutes and could barely lift the hammer over my head. I was drenched in sweat and felt breathless with exhaustion. With each crashing blow, I thought my shoulders would pop out of their sockets. This man shows me how he breaks rocks with an 18-kg hammer in 40C heat for $0.02 per square foot of crushed stone. Thousands of men like “Sameer” are involved in this work throughout India, and many of them work in slave-like conditions. This, despite the fact that the first Supreme Court victory in India against this type of exploitation all the way back in 1983 involved a claim by bonded labouers who were crushing stones, in a quarry in Haryana. I asked Sameer if he were ever injured doing this work. He offered a wry smile as he pointed to scars and gashes all over his legs, feet, and hands. Frail and grizzled, Sameer was forty-two years old, and had been crushing stones since the age of twenty. Beedi rolling is another industry I explored for the first time during this trip. 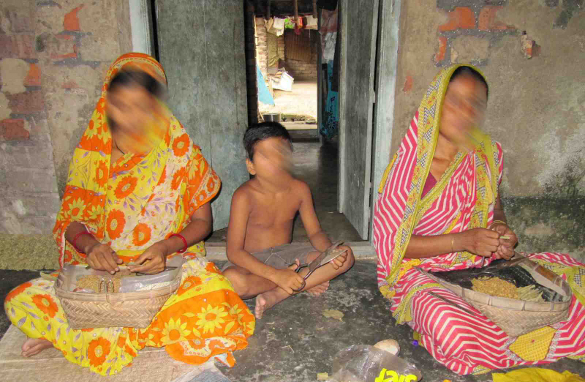 In West Bengal, entire villages are caught in forced labour in the beedi rolling industry. In one village about three hours north of Kolkata, I met several villagers who showed me how they roll upwards of one thousand beedis per day. Contorted fingers and respiratory ailments from incessant tobacco inhalation are just a few of the maladies that plague these people. “Amina” was five years old when she started rolling beedis. She is now twenty-two. Her grandmother still rolls beedis. The villagers have no choice because the landowner’s agents bring the dried kendu leaves and tobacco each week, and they know how to make sure the villagers roll the beedis. Forced labor can easily give rise to human trafficking, where people like Amina who are desperate for better wage-earning work succumb to offers from traffickers for better jobs in big cities. Throughout rural West Bengal, I met numerous young girls who fell prey to offers for domestic work in cities like Delhi, Mumbai, and Kolkata. They ended up working for well-to-do families around the clock, and after several months they were paid perhaps ten or twenty percent of the promised wages. Eventually, they are returned home, where they are just as desperate as before. I asked one such girl, “Khadija”, if she would ever take such an offer again. The absence of alternative is a deeply underestimated force of coercion for countless victims of human trafficking and forced labour across India, South Asia, and beyond. It is a complex matter involving extreme poverty, socio-economic disenfranchisement, bias against minorities and females, lawlessness and corruption, government apathy, and many other factors that consign millions like Sameer and Amina to lives of slave-like exploitation. These people spend their painful years quietly tucked away behind the shadows of the globalized supply chains that provide low-cost materials to producers, and cheap end producers to you and me. We want to know what you think. What form does human trafficking take where you live? What do you think needs to be done to stop this practice? We'll be putting your questions and comments to Siddharth Kara each week. Must Immediately Improve the Health, Safety and Well-being of ALL People! So that Truth Alone Triumphs! What is the point of this article if the most important aspect – solutions – are missing! What, you get paid to write about people's suffering? Is there a law agianst that? 1. It is important to know what Humans are capable of doing to their own people. The injustice of greed that we are all capable of doing. 2. The article gets you thinking about how to look for opportunities to improve the world that is near you. If we can help at least one person near us, maybe we have started something positive. 3. The local people need to organize and try to at least improve their salaries. There is power in numbers. 4. Send a prayer, a thought, a bit of energy toward the suffering of all those poor people cutting rocks. Who knows maybe if there is enough positive energy going their way: a miracle could happen. Thank you for researching and publishing this article. 5. Collect tax from the wealthy . Unfortunately, globalization is increasing the exploitation of more and more people not only in India but in many Low Income countries. These are the regions where labour unions are not effective or non existing. This is why we must boycott China otherwise we will be digging trenches for them. There are just too many things wrong in India..
Have been to Chennai and Mumbai and it was just horrible. Difference between rich and poor and the way poor people gets treated..so wrong. And yet the country has no signs of changing that, despite getting richer and richer by the day. At some point, due to severe overpopulation, there will be a huge famine in India and likely noone there will care, till it hits Western media and then theyll care only cause of the bad publicity. Also been to China, Beijing and places a little south of there, and though there is the same milewide difference between rich and poor, at least its TONS better than what I saw in India. We should boycut India somehow, but its probably too late, since their economy is too strong for us to have political influence anymore. Forms of slavery exist all over the world, even in America; it's called the minimum wage. The rich oppress the poor everywhere, and the governments do nothing about it, because they work for the rich. Until people rise up and take away the power of the rich (revolution, peaceful or not), the devil will stay in the driver's seat. It is frustrating; that is why Jesus kicked over the money changers tables. We need to investigate the crimes of the rich upon the poor (Wall Street) and punish, Old Testament style (severely), the greedy, oppressive wrong doers. It is only just in the eyes of any fool, and Great God. It is a shame and shock that we educated Indians ignore the bonded labor environment and exploitations in several industries in India and other parts of the emerging and underdeveloped world. We need to mobilize local social leaders, and local NGO's and the local senators to take up the leadership and seek the change. This has to be supported by educated global Indians and global citizens like us. I am here to volunteer some of my time and energy to liberate a few of these lives and give them a better hope for the future. Amazingly all examples of forced labor are MUSLIMS. Wondr why? Not to say that ther would be other's also, the so called "biggest democracy" of the world treat its 20 percent minority like crap and the world pays no attention to it. When Kashmiris object to such inhumane behavior, they are termed as terrorists. What about the govt. leaders ? Do they have NO concience or empathy at all ??? you can try following new recipes to shock and titillate us..
Moderation ?? What's moderate about people who are treated like this ??? This is a clear example of the way muslims are sufferıng ın India, hundus are all well off, ın my last visit to ındıa ı have wıtnesed ıt quıet explicitly. It was some 15 years ago, we were visiting my folks in Assam, India when my US born teenager was furious when he saw a 12 years old young kid was serving us food. My son sreamed at my cousin that child labor is illigal . But my cousin defended his act saying that the kid servant is getting a place to sleep and to eat ; otherwise he will have to steal or go hungrey. I didn't see that way because I grew up with those kind of child labor while I was in India. But my young child opened my eye and since than I have been very vocal about it. Both my son & I when we travel thru the third world. We too saw similar attitude in Africa, Latin America & and in Asia. It is very sad and I am very ashemed for to see the mistreatment of the poor & oppressed by people who looks like me. This is heart rending, but true. The injustice humans can mete to their own is disgraceful and mind numbing. Man is not capable of gauging the extent of evil he can perpetrate. Unless the human heart is fundamentally changed, no legislative nor judicial body can curb these problems. Until then, each of us has to do our best, in our capacity as humans, to ameliorate the living conditions of the "less privileged". Though I am an Indian. I am not being sad at the article posted above. Because for me it is one more thing that got exposed which is wrong in India and million other things not exposed. Problem with India is simply this "Indians divided among themselves and against themselves". No body is caring about the destruction of the basis. I have watched both poor and rich people in India. Issue is with both of these people. Rich people always try to exploit poor people. And in case of poor people if they are getting help and concession from government for their poverty they don't want to come out of poverty rather like to be in poverty and enjoy all the subsidies and the help provided by government. And too sad the politicians got an excellent training how to exploit people without letting the people that they are being exploited. Indian judiciary system is , I would say the worst in world. If you make an accident in USA you will be properly judged or atleast the verdict will be given immediately. But in India it wont happen because people will run away from the place very easily after causing the accident and even if they come under trial it will take atleast 10 years to end the trial. This is just an example. For me above is just another crap happening in India which we need to blame for lack of unity in India and lack of self respect and fear to take the respect from others. There is no law and order in India because people dont want them to be controlled. One data is before 60 years back the population of India is 30 crores but now it is 110 crore. People would like to enjoy the life without thinking about the spoiling of the infrastructure in the country. If that is the case of being irrespoonsible towards country the above such crap will occur. I read this article, and several of the comments, and the only thing that was going through my mind is yes this is happening and its such a tragic tragic thing. There is little that can be done due to the fact there are several things that need to change before this can change, these have to due to the type of society they live in, it is very sad but both social and religious factors hold these people to the level they end up being degraded. This said I am not meaning to slam or chide n deride folk for their way of life. In fact The bible tells that the human race will face this and greater tragedies just before the coming of the Messiah there are many who will see this and truly degrade what was said around 2000 years ago, but for what ever reason they see no difference. Our little world is suffering from the greatest disease the disease of Selfishness, which causes one human to treat another with no form of respect no form of kindness, it has been said change starts with me. SO lets all do our part even the smallest act of Kindness can change a whole people group. The story goes a man from Australia was coming to the U.S. met a woman who couldn't pay for her ticket due to the fact the cashier wouldn't take check or credit so having the cash in his Pocket he paid for her ticket allowing her to come to the states to see her first grandchild. This act lead way for thousands of people learning about a message of health and a deeper connection to the creator just for the cost of a ticket. what lil act can you do to change lives in the world around you? Kudos to Mr. Kara for exposing this. Please keep these contributions from his work in the field coming. They are very valuable to those of us wokring and educating on human trafficking and modern day slavery. I believe these reports will be truly impactful. We need to spread awareness about the 'Fair Trade' products. Our society is a consumer-based, consumer-run society.